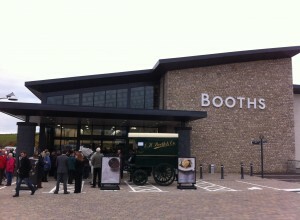 Westgate House provides a new supermarket for Booths as well as an additional shop unit for Mountain Warehouse. The site is located on Brunswick Road, Penrith on the edge of the Town Centre. The supermarket creates a dramatic glazed pavilion set on a local red sandstone plinth and framed by red sandstone bookends. The design creates public realm and footpath connections to the town centre and adjacent residential areas.